Core parts of this article were released to Cash Flow Kingdom members on November 1st and November 9th. The best sale this holiday season isn’t available on Amazon. Nor does Macy’s, or Home Depot carry it. Nope, daddy isnt hoping for a Tesla with a big bow on it in the driveway. What I want to find wrapped up under my Christmas tree is a few more shares of energy equipment and service sector stocks. 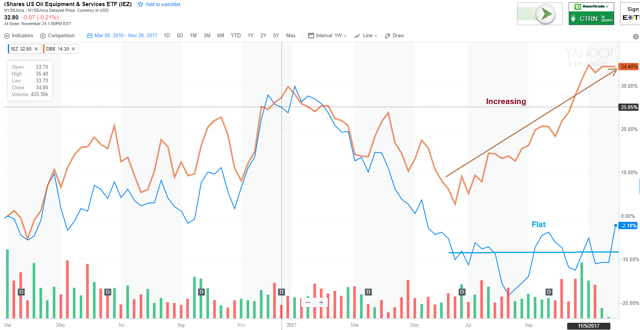 Historically according to buyupside.com, 70% of the change in price of Energy Equipment & Services stocks (IEZ) is explained by changes in energy prices (DBE). This makes logical sense, increasing prices create increasing demand for product, which in turn results in increasing demand for support services. However, since July there has been a notable divergence; the energy equipment and services sector has been flat, while energy prices have been increasing. During this period (2nd half of 2017), North American drill counts were also flat. The downturn in drill counts bottomed in the summer of 2016, followed by 12 months of expansion (2nd half 2016 through 1st half 2017), but has been flat the 2nd half of 2017. 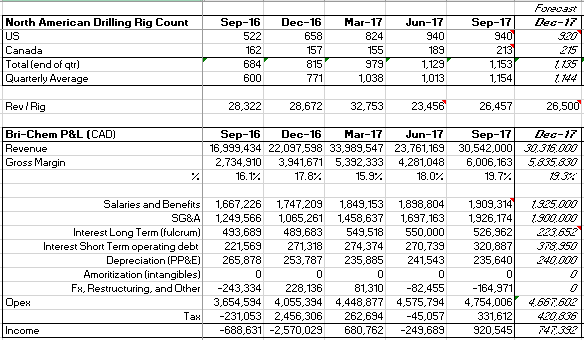 Anecdotally, what I have heard is many drilling companies used up most of their 2017 approved capex budgets in the first part of the year. Given the losses funders took in previous years, perhaps it was not completely a surprise they are being a bit more cautious this time. Many probably want to see production generated by the capital they extended since mid-2016 start to pay for increased drilling, and/or have been reluctant to grant another mid-year increase in capex budgets. The nature of the business is cash flows out of the company up front to drill the well, but only starts to return after the drilling is complete and the oil and gas start to flow to market. Recovery of this cash thus is both delayed and happens over an extended period of time. This, and normal calendar year budget cycles, may have created a pause. Thus, while there are still plenty of profitable projects, demand supported by increasing exports, and improving prices for their output, drilling has been delayed pending the new 2018 capex budget approval and funding. Most companies start there next year budget in November, but don’t really get to a finished approved and funded plan until the new year. Thus, to the extent this theory is true, the 2nd half decoupling of drilling counts and service company stocks from energy prices may be a temporary phenomenon. A phenomenon likely to start reverting to the mean in late Q1 and Q2. If so, this in turn could spark a significant rally in the energy service sector stocks. With the help of Intrinio.com I compiled a list of publicly traded companies in the sector along with some favorite ratios and statistics. There were 48 firms, so I used positive trailing twelve months Return on Invested Capital ROIC to cull the list. Return on Invested Capital is one of the better measures of management effectiveness; what management has been able to produce, with the resources they have been given. Next, I highlighted in green the companies with an ROIC in the top third (top 6 or 7 companies). In other words, looking backward I wanted to favor effective management. Those who have been producing a higher return on the capital they had been entrusted with than others. 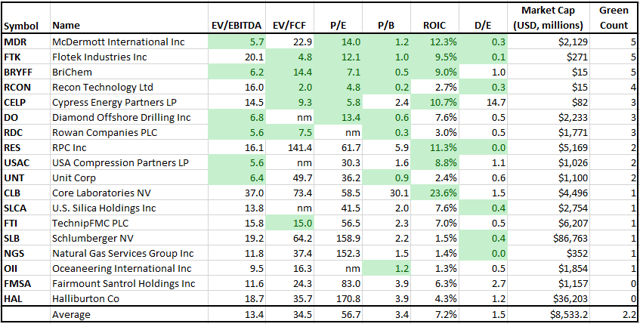 I did the same, highlighting the top 6 or 7 companies in each column, for the various valuation and risk metrics. Finally, I counted the number of green highlighted cells, sorting first by that number and then by ROIC. This in effect first over-weights valuation as the first three columns are all primarily valuation metrics (P/B can be argued to be both a valuation and risk metric). The overall theory being, I wanted to favor valuation, what I am getting for what I am paying, but also wanted to pay attention to management performance (ROIC), and risk (D/E, P/B). Overall, the cream which rises to the top, those with the higher number of green cells and higher ROIC, are those most likely to be worth further analysis. Not as a selection criterion, but rather for information purposes for the reader, I also added in a Market Cap column and an average row. Readers may find it useful to look at the chart above and decide what is most important to them, and which of these opportunities therefore are the more interesting for them. Sector giants Schlumberger (SLB), and Halliburton (HAL) made the positive ROIC cut, but otherwise scored relatively low on this list. This is not all that surprising since the first 4 columns all have a valuation component to them. Right or wrong, individual investors, funds and indexes all favor size. This in turn tends to make larger companies have more overall demand for their shares, and thus less favorable valuation ratios. Most investors are willing to pay more for companies that are larger. While paying an Economic Value of 19 times EBITDA for companies like SLB or HAL, companies with less than a 5% return on the capital, might not seem the best choice for me, I respect that each person is different. Therefore, each person must decide their own particular comfort level and investment criteria. Larger companies will usually have the benefits of being more well known, diversified, easier to trade, less volatile, more experienced management teams, more analysts covering them, and thus make people feel more comfortable owning them. Companies with lower market caps on the other hand, if they grow, can not only have the advantage of outperformance on a company level, but can also get an extra boost in overall demand for their shares simply because they grow and thus start qualifying for more and more indexs, funds, and professional analyst coverage. Individual investor research applied to small and micro-caps can therefore be more fruitful, allowing one to benefit from value and growth which is not already priced in. Doing a full analysis and write-up on all five however would be way too long for the reader in one sitting; I will therefore just concentrate on one of these names for the rest of this article. I do not find it at all surprising that relatively unknown, micro-cap, Bri-Chem (OTC:BRYFF, BRY.TO) scores near the top of the energy equipment and services sector in most metrics. 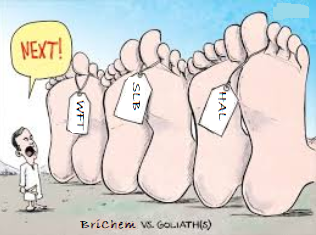 I have been following it publicly for more than a year– King Oil Is Dead; Long Live The King, Part 2: Drill, Baby, Drill, Drill Baby Drill: Bri-Chem Earnings Preview And Forecast Update, BriChem Refinance Should Increase Earnings By Over 50% –and privately in Cash Flow Kingdom even more frequently. As a matter of fact, had I not included Bri-Chems revolving ABL facility as part of ongoing debt, its D/E would have dropped to 0.3. This in turn would have caused that metric to be green, and placed Bri-Chem standing all by itself at the top of the heap. Q3 Revenue was up 80% vs. the previous year. Gross margin* was up 360 basis points vs. the previous year (19.7% vs. 16.1%). Opex had a 590-basis point improvement vs. the previous year (15.6% of revenue vs. 21.5%). EBITDA was $2.3 million for the quarter, far exceeding both last years $99k (+2,300% vs. Sept 2016), as well as the previous quarters $787k (+292% vs. Q2, Q2 is negatively affected by seasonality). *Management devoted a section of their prepared remarks in the conference call to explaining not only why margins were stronger than previous history, but also why they expected that strength to continue for at least the near future. Higher margin regions. experienced an increase in the number of wells drilledpurchasing certain commodities more cost-effectively. international vendors. margins are expected to remain strong for the remainder of ’17 and into 2018. What I found most appealing about Q3 however has not even benefited the P&L, yet. At the end of Q3 Bri-Chem managed to refinance its long-term hard money debt (a.k.a. the Fulcrum debt) into something much more reasonable (1000 basis point reduction in effective interest rate). This refinance is a game changer which meaningfully reduces risk, and will add significantly to future earnings and cash flows (Bri-Chem Refinance Should Increase Earnings By Over 50%). The refinance in essence is what is going to allow shareholders to maintain their ownership (no dilution necessary), in this growing firm. 1.) Revenue: Drill counts may not increase much in Q4 due to capex budgets being spent, but those budgets are likely to see considerable increases for 2018. Energy prices are up; drillers are making money. The relief valve effect of more energy export is alive and well (the US should become a net Natural Gas exporter in 2018, crude oil can now be exported from the US, and the spread between WTI and Brent is high). These could lead to higher 2018 drill counts thereby driving Bri-Chem revenue. 2.) Margin: Bri-Chem gross margins are strong and have been increasing. Management guides that they will remain strong, and talks of new sourcing which could increase lead times and inventory related debt, but also lower costs. 3.) Expenses: As we have already seen with OPEX as a % of revenue dropping 590 basis points, there is some economy of scale in this business. Where you move 5,000 bags of product out of a warehouse per day, or 6,000, it is the same warehouse, the same equipment, and to a certain extent the same number of employees moving that product. Additionally, as already indicated, the long-term debt refinance reduces interest expense by over $1 million per year all by itself. 4.) Business Expansion: Bri-Chem opened a second mud plant and drilling fluids warehouse in the Permian at the end of Q2. In Q4 they opened a testing lab and mud school in Bakersfield. In the conference call they also talked about expanding deeper into certain active resource plays in the U.S.A. drilling market so we can continue to expand our growing client base and secure more overall market share. As of the last management information circular (5/2017), Don Caron, the CEO, has about 2 years worth of his salary invested in Bri-Chem (about 5% of outstanding shares). In addition, his bonus plan is directly tied to sales and EBITDA targets (50% of salary bonus potential, none paid in 2015 & 2016 due to poor Bri-Chem performance), and he gets options for 150,000 shares per year (exercise prices $1.80 – $2.94 CAD). This seems reasonable alignment; though I would like to see management also clearly articulate and follow a capital allocation strategy. Brian Campbell the former CEO owns about 9% of Bri-Chem. A family office called Boeckh Investments owns another 13%. Debt: Bri-Chems main risk used to be the dilution its high cost (19%+ including fees), hard money debt could have caused. However, with the recent refinance, much of that risk has gone away. The new long-term debt at 9.25% variable interest rate (30 day average Bankers Acceptance Rate +8%) is still relatively high, but not unreasonable (essentially a BDC loan). With the ABL well covered by non-perishable inventory, and long-term debt at less than 1.5x EBITDA, I no longer consider this a primary risk. Paying down this loan however seems a promising use for excess cash flow, a 9.25% risk free return. Demand: Bri-Chem main risk now, is the same as for the rest of the sector, North American drill counts and the energy prices which can affect them. Were North American drill counts to decline, Bri-Chem would be negatively affected; were they to increase, Bri-Chem would benefit. This is nothing different than most names in the energy equipment and services sector. Seasonality / Weather: Bri-Chem has significant operations in Canada. During the spring break-up period (a.k.a. mud season), it is difficult for heavy trucks to move around. This typically causes a buildup in Bri-Chems business leading into the spring break-up, and a slowdown following that break-up (Q2 is usually a seasonally weak quarter). Management skills: In the past, excess cash flow and debt was used for growth, the ill-timed purchase of an energy industry pipe manufacturer. This, and a sharp downturn in energy prices which followed, led to Bri-Chem having to sell that purchase at a loss, and take on hard money debt with onerous terms. While I have spoken with management, and listened to their conference calls, I do not have a good feel for their capital allocation skills going forward. They did do a very good job of getting in front of the downturn, cutting back to survival mode earlier than many. They have also so far shown more caution with growth this time around. However, they have not articulated a clear Free Cash Flow yield oriented capital allocation policy. I see it as a significant fault which should limit the amount of capital and multiple one is willing to assign. Size: Bri-Chem is a thinly traded micro-cap stock. As such one should only buy or sell using limit orders. The US symbol BRYFF (quoted in USD) can go multiple days without a single trade. The Canadian symbol BRY.TO (quoted in CAD), only trades about 30,000 shares per day. Thus, I must caution one cannot expect to get in or out of this stock easily. For these reasons any position should probably be smaller than normal and held with the long term in mind. Dont think of investing in Bri-Chem so much as buying a readily fungible stock, but rather a long-term piece of a company in the drilling mud business. On the other hand, this fungibility issue is probably why you are currently able to get a profitable company which grew revenue 80% last quarter for only 6.5x EV/EBITDA. At the current price of 69垄 CAD, Bri-Chem has a 2017 (includes December 2017 estimate) valuation of: P/B = 0.6, P/E < 8, EV/EBITDA = 6.5. This is considerably lower than the averages for the sector and seems very cheap considering the company is one of the best performers (if not the best performer), in the sector. Bri-Chem grew revenue by 80% last quarter (Q3 ’17 vs. Q3 ’16), and EBITDA by so much quoting an % increase seems a bit ridiculous ($2.3M vs. $99k, technically a 2,323% increase). It’s price would be $2.76, a 4x increase, if one were to simply assign the sector average 13.4 EV/EBITDA multiple to it. That may be a bit of a stretch but to put it in perspective realize Bri-Chem traded above $2 per share back before oil prices collapsed. That it now trades well below book, while simultaneously showing such spectacular growth, is a potentially fortuitous discovery for those reading this. I think a less sensationalistic way to look at -is from a cash flow point of view. Here you are securing a 17% Distributable Cash Flow DCF yield which has been and is likely to continue growing in the future. While I dont expect them to actually start issuing a dividend any time soon (frankly they have much better choices), this is in theory what they could pay out. Alternately they can use this cash flow to buy back stock, expand the business, or pay down debt (9.25% risk free). This attractive DCF yield is after, or should I say despite, a price which increased 33% since the subordinate debt refinance news came out a month ago. For now, I am keeping my near-term target for Bri-Chem at $1 CAD, a 45% increase from today. This $1 already reflects a significant discount for micro-cap size, is 20% below book, and less than 8x EV/EBITDA. Some might argue it too much a price increase to expect in one quarter, or worry that the 33% increase in price which occurred since the refinance was announced a month ago is too much, too fast. Respectfully however, I have to disagree. I think the greater loss here may be missing the boat. Understand, these same concerns were articulated repeatedly at much lower prices. Safety in Value appears to have been responding to them back when he suggested, Bri-Chem Trades Cheaply Even After A 75% Move In 2 Months (one year ago when Safety in Value wrote that article, Bri-Chem had just moved from 19垄 to 32垄). In the comments below that article I lamented, I kinda wish you hadn’t shared quite yet. I’ve got a decent long position but wasn’t quite sure it was as much as I wanted yet. Ultimately however, as the story played out, I continued to add to that existing position in the 30s, 40s and even 50s. I am glad I did. Like Safety in Value, I didnt think waiting until the price comes down a little bit, was a good idea. Nor do I now. Given what Bri-Chem accomplished in Q3– the refinance, the revenue increase, strong margins, and EBITDA growth– just greater awareness has a good chance of getting BriChem to the $1. Once I expand to a full 2018 forecast, I expect to increase this target. The energy equipment and services sector is cheap, and may be poised to rebound with new budget year approvals. A number of this sector’s stocks are attractive including: Schlumberger, McDermott, Flotek, Bri-Chem, and Cypress. Bri-Chem may be the best of the bunch. It is rated a strong buy with 45% potential near term upside. Disclosure: I am/we are long BRYFF, APLP. Additional disclosure: This article discusses speculative investments. I do not know you: your goals, risk tolerance, or particular situation; therefore, I can not recommend any investment to you. Please do your own additional due diligence.